Obviously my bike ride is loosing interest to my followers and in fact the readership is now back to folks doing searches that bring up my old posts. e.g. Scarpa hiking boots received as many hits yesterday as my latest post and my Silva Pedometer post from 6 years ago not far behind. Enough of such nonsense. 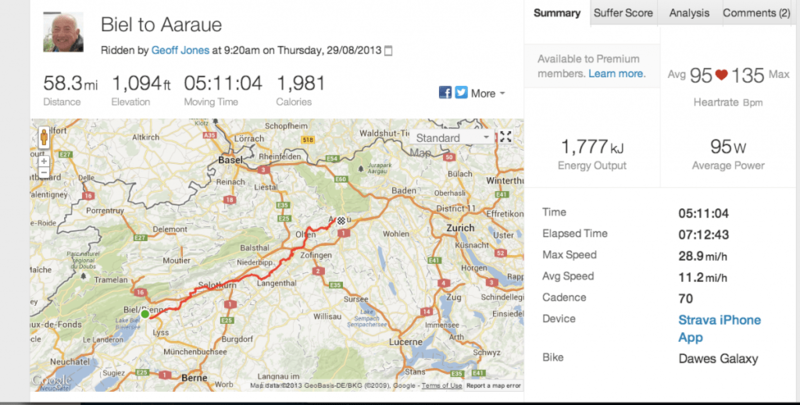 Today was a wunderbar ride especially the section from Biel to Olten following the River Aar. Many cafes, beautiful buildings & bridges. 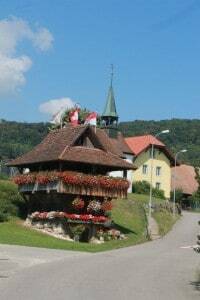 The route is very widely used by groups of cyclists (although don’t expect a nod or a danke from any of them). The weather was perfect crisp & sunny with a good mixture of riding surfaces from cobbles in the towns to gravel and ultra smooth inline skating tracks. Tonights hotel is the Hotel Argovia which is an annexe to the Sorell hotel outside the railway station. A novel feature is that on my bedroom door it says that my room is 14.7m2 , Window area is 2.4m2 and the bed area is 2.54m2! Just popped by to say that I’m still reading! (And whilst poking around your website came to realise that I’ve never been here before (reading, as I do, via a RSS reader)). You are doing more miles that I did the last day or so.